Your car's performance exhaust system needs to be working correctly to keep your car in top operating condition. Performance exhaust systems, whether they are aftermarket exhaust systems, custom exhaust systems or stock systems, help your vehicle in a variety of different ways. The exhaust system creates a more enjoyable driving experience by quieting the engine noise. It also reduces air pollution by controlling the emissions your vehicle releases. Having a properly operating catalytic converter is crucial to ensure that the exhaust system does not have leaks. 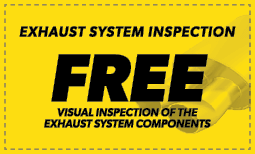 Visit your local Meineke #2084 in Durham, NC, today for more information about maintaining high-performance exhaust systems. A common question we get is: "How often does my performance exhaust system need service?" This mostly depends on the age and mileage of your car. If your car has higher mileage or it's more than 8 years old, there is an increased probability that your exhaust system will need more frequent maintenance or repairs. If you're concerned about your exhaust system or muffler, there is no harm in getting it checked out. Contact our Meineke #2084 muffler and repair shop in Durham, NC, and we can answer any questions you have regarding muffler repair cost or perform any necessart maintenance. If you start to notice a loss of power or a new vibration when driving your car, make sure to have the exhaust system inspected by a professional in Durham, NC. We are a premium muffler shop specializing in muffler repairs and high-performance exhaust systems. You may notice a new vibration when handling the steering wheel, touching foot pedals, or just sitting in the seat. This may be an indication that your car's engine is no longer operating at peak capacity. Our experts at Meineke #2084 can provide a muffler repair cost estimate, perform muffler repairs and recommend custom exhaust systems for your car. A catalytic converter is a commonly overlooked item on a car. This component is located inside of the exhaust pipes. It reacts chemically with spent fuel vapors that pass through it and completely burns away pollutants before they reach the outside air. Manufacturers are required to warranty these components for only 80,000 miles. While necessary, catalytic converters also restrict the efficient flow of air through an engine, which can minimally reduce the power output. High performance exhaust systems overcome this limitation, and many aftermarket exhaust components enhance the original design. Replacing worn out catalytic converters and installing custom exhaust systems are complicated jobs. Contact our in Durham, NC, to see what we can do to improve or repair your vehicle. Once you learn that a new exhaust system is necessary to repair your vehicle, you may be wondering where to find the best muffler shop in Durham, NC. We have many locations available for you to choose from so you can get the performance exhaust system you need at a time and in a location that is easy and convenient for you. At Meineke #2084, we understand that muffler repair cost is one of the biggest concerns on your mind. Fortunately, our technicians are committed to giving you the best service possible to make your aftermarket exhaust repair experience a great one. Stop by today to learn how we can improve your ride’s performance with one of our affordable custom exhaust systems.